A serious and possibly life-threatening condition targets preemies and ill newborns. Enterocolitis or coloenteritis can be seen in adults in various forms, and targets the intestines with differing degrees of pain and irritable bowel movements. We will learn of the two common types of this condition, as well as the enterocolitis symptoms to watch for. Before we dive further into this condition, what is enterocolitis? This condition results in inflammation of the small intestine (enteritis), as well as the large intestine (colitis). The digestive system can develop issues that directly affect the small and large intestine. Bowel problems such as Crohn’s disease and irritable bowel syndrome (IBS) have a link to the condition. Necrotizing enterocolitis (NEC) and enterocolitis due to Clostridium difficile (C. diff colitis) are the two common types of this condition we will discuss. This form of the disease exists when the wall lining of the intestines become damaged to the point where it begins to die. As it becomes inflamed, the intestine itself can also be affected as the walls thin. If a hole develops, any harmful bacteria located in the intestine may move into the abdomen and result in an infection. This condition presents within the first two weeks of life. More than 60% of all cases happen in preemies, with some cases developing in low-birthweight newborns. Other conditions that can put babies at risk include formula-feeding babies, those in daycare centers, and infants receiving blood transfusions. Better known as C. difficile, this condition involves bacteria invading the large intestine, resulting in irritation and inflammation, or colitis. It results in fever, cramps, and diarrhea. This form is often referred to as pseudomembranous enterocolitis, and it may be the result of antibiotic use. It also may be contracted through an infected person. Clostridium difficile colitis commonly occurs in elderly patients in nursing homes and hospitals. It can also be present in those receiving chemotherapy treatments. Enterocolitis falls under different classifications of causes. The more common cases involve bacteria such as E. coli, Salmonella, and Shigella. It also includes viruses such as adenoviruses, enteroviruses, and rotaviruses. Other infections may involve amebic dysentery, giardiasis, and candidiasis. Further complications may result in the discoloration of the abdomen as the intestine begins to weaken and tear. A medical assessment by your physician will include a complete medical history, compilation of symptoms, and a physical examination. Further testing may include a complete blood count test, urine and stool samples, inflammatory marker tests, abdominal x-rays, an ultrasound, a computerized tomography (CT) scan, a colonoscopy, or a barium enema. With the possible risks involved in treating this condition, treatment will vary based on the symptoms, the age of the patient, and severity of the disease. Most cases may be treated with bowel rest, nasogastric suction, intravenous fluids, antibiotics, anti-diarrheal medications, and blood and platelet transfusions. These procedures are usually performed in the intensive care unit at a hospital for close monitoring. If the progression of the disease is too great for regular treatment or if it’s severe, surgeons will perform one of three surgical procedures. One may involve the drainage of any abscesses, air, or fluid pockets. Another surgical procedure may include a right hemicolectomy or a total abdominal colectomy. Lastly, a procedure known as a loop ileostomy may be done on the affected portion of the large intestine. Young enterocolitis patients face serious complications such as dehydration from extreme vomiting and diarrhea. Chronic cases may lead to digestive system problems, sepsis, intestinal perforation, and inflammation of the intestine itself. Depending on the sufferer’s needs and the severity, it may be recommended to increase intake of probiotics for better digestive function. These foods may include buttermilk and yogurt, as well as healthy fats, olive oil, fish oils, and walnuts. Foods to avoid include fried or spicy foods, dairy products, fats, caffeine, alcohol, and red meat. Enterocolitis is a serious condition that may lead to life-threatening complications. Digestive problems can lead to this condition. Most cases occur in premature babies and newborns. 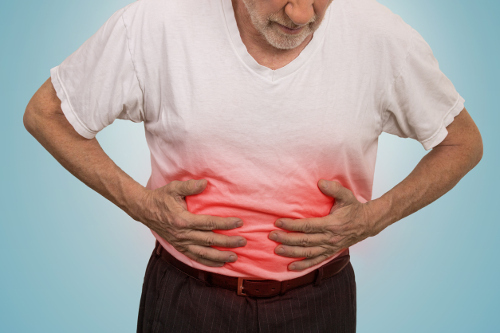 Inflammation of the small and large intestine wall linings can present gastric issues such as diarrhea, bloating, cramping, nausea, and vomiting. These symptoms can lead to severe dehydration and tearing of the intestinal wall. The condition will require close monitoring in a hospital setting for most cases, and those with severe cases will need surgery. Holm, G., “Necrotizing Enterocolitis,” Healthline, January 21, 2016; http://www.healthline.com/health/necrotizing-enterocolitis#overview1, last accessed July 11, 2017. “Clostridium Difficile Colitis – Overview,” WebMD, April 24, 2017; http://www.webmd.com/digestive-disorders/tc/clostridium-difficile-colitis-overview#1, last accessed July 11, 2017.